Spacious home with two kitchens and two living rooms close to downtown. Enjoy a unique—and breathtaking—view when you stay at Osprey Lodge. 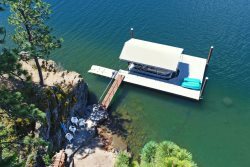 This home overlooks captivating mountain ranges and the world-famous “Floating Green” that rests elegantly on the waters of Lake Coeur d’Alene. This notable feature is part of the award-winning Coeur d’Alene Resort Golf Course—an 18 hole, 6,803 yard, par 71 course on 200 beautifully sculpted acres. Throughout the course you’ll enjoy 60,000 different flowers that add to the beauty, ranging from wild flowers, petunias, junipers and geraniums. Beginners and pros alike will enjoy playing a round (or two) surrounded by one-of-a-kind North Idaho views. When it comes to entertaining, this home has you covered! You’ll have access to two full kitchens—both with refrigerators, sinks, stoves, ovens and dishwashers! The main floor kitchen offers large high-end counters with ample space for meal prep and additional counter space can be utilized in the downstairs kitchen. When it’s time to enjoy your feast, you’ll find a wooden table with seating for six or you can take your plates outside to the spacious deck. You’ll also be seeing double in the home’s two living/entertaining spaces. When you enter the main level living room your eyes will immediately be drawn to the floor to ceiling windows (with Floating Green views), stone fireplace and stunning wood-lined vaulted ceilings. Completing this area is a sectional couch, TV, Blu-ray player and Bluetooth speaker. The kids will love the downstairs entertainment room that features a TV, Xbox, fold out table with seating for two and sleeper sofa. This home has great snoozing accommodations! Three bedrooms offer queen beds and the master includes a king bed and an attached bathroom that features a beautiful vanity area and a shower/tub. There are two other spacious bathrooms—one with a shower and one with a shower/tub—offering plenty of space for everyone to get ready in the morning. Outdoors you’re sure to see wildlife roaming through the large trees that surround the property while you sip your morning coffee. Everyone will enjoy spending time on the roomy deck that’s complete with a BBQ, table, chairs and large umbrella. The massive yard below is the perfect place for the kids to have a blast wearing themselves out. At Osprey Lodge you’ll feel peacefully away from it all while actually only being 10 minutes from downtown Coeur d’Alene’s public beaches, parks, shopping, dining and entertainment. Matt and Marrisa at Vacation Rental Authority were wonderful to work with and so helpful. We had a perfect vacation, thank you. Great house, I appreciate the fact it had a few tools (had to move a ski rack) and a few basic spices/oil for cooking. More functional than a stripped down vrbo. great view, a bit odd to find but that comes with the view. NIce house,, great view. Has a few handy things like tools / spices. Cold in the downstairs bedrooms. we had an issue with another home that we'd rented from another agency, and Nicole quickly and professionally helped us identify this home for us to move into that same day. Great summer rental with spectacular lake view, large yard and spacious open main floor. Large master bed/bath on top level, 1 small queen bedroom on main level, 2 small bedrooms on lower level. Great for 2 families staying together, as bottom level has 2 bedrooms, bath and kitchen. They were very helpful and prompt about getting back to us. When we had a need it was taken care of. We enjoyed staying at Osprey Lodge, it was close to everything and yet set up where it's nice and quiet. We loved the view of the lake. We had a sink that was stopped up and the girl in the office sent someone within the hour, which was very impressive. Very helpful and relaxed when our door code didn't work. They had alternative code and we even got in a bit early as we forgot the time change and had nowhere to go with all luggage. We all enjoyed the airy home and even the workout area of the home as well as the TV and movies and games they had. We loved the openers of the home so we could all be in one area when we wanted and had privacy when we needed it. Three floors of bedrooms so nobody was bothered by other people's sleeping schedules. Great home away from home. The spaciousness was wonderful! We didn't feel cramped or crowded. The jetted tub was fabulous! With just one exception, it was excellent. You get more than a five star rating in getting my left behind computer to me in one day. Your staff was terrific, Tate assured me that this was not a problem and sure enough I received it the next day. Her confidence was very reassuring and very much appreciated. It would have been very helpful to have had a broom to sweep the floors. There may have been one, but we did not find it. The extra blankets provided were much appreciated, our kids had been cold with the one provided. We would come back in a minute. we enjoyed the house, it was very clean and maintained properly everything was how it was presented. Special Thanks to Staff member Annie Johnson she was awesome with complete knowledge about property and very friendly personality to go extra mile for customers satisfaction in entire process of renting and finding the right property for the guests needs "Hats Off" to Annie! wow! we all felt like its the home better than our homes, felt was very easy of everything and as presented in advertisement.. I had a great overall experience. The booking was very efficient and payment was easy. We received instructions a few days before leaving for our vacation and were provided all of the information that we required during our stay. I have zero complaints or suggestions, very quality experience. Honestly, everything from the easy keypad check-in to the quality of the property was really outstanding. Best compliment I can leave is that all everyone talked about as we were leaving was how much we needed to come back and stay in the exact same location. We really enjoyed the size of the backyard and the view of the lake, resort, and city from the it.